Over the 4th of July, my family lost our black cat, Bosley. He might have been a stubborn, little cat, but we sure did love him. 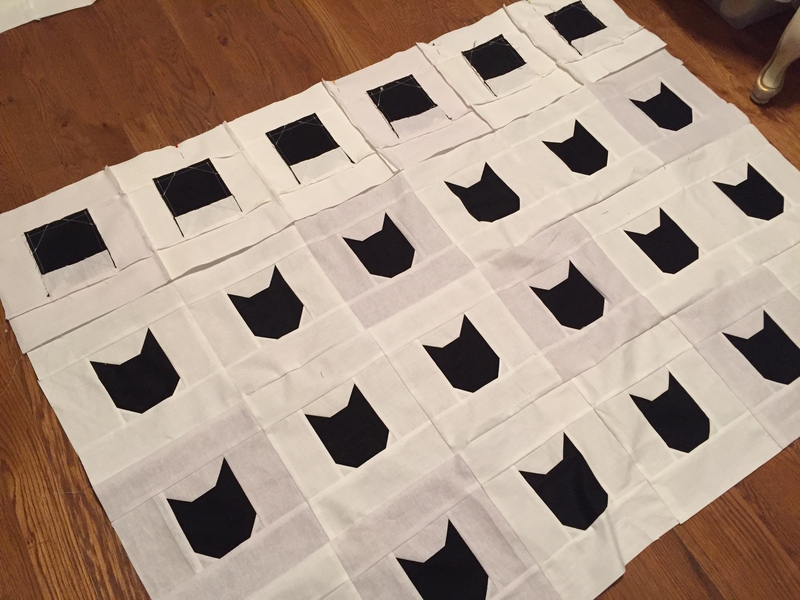 Awhile ago, with the help of Pinterest, I stumbled upon mermag.blogspot.com and this fantastic pattern for a black cat quilt. This fall, I decided to make it for my mother’s birthday. I figured that a quilt would help keep her warm this winter since Bosley would not be by her side. The final result was fantastic, and thanks to Merrilee’s pattern, it was quick and easy to make! 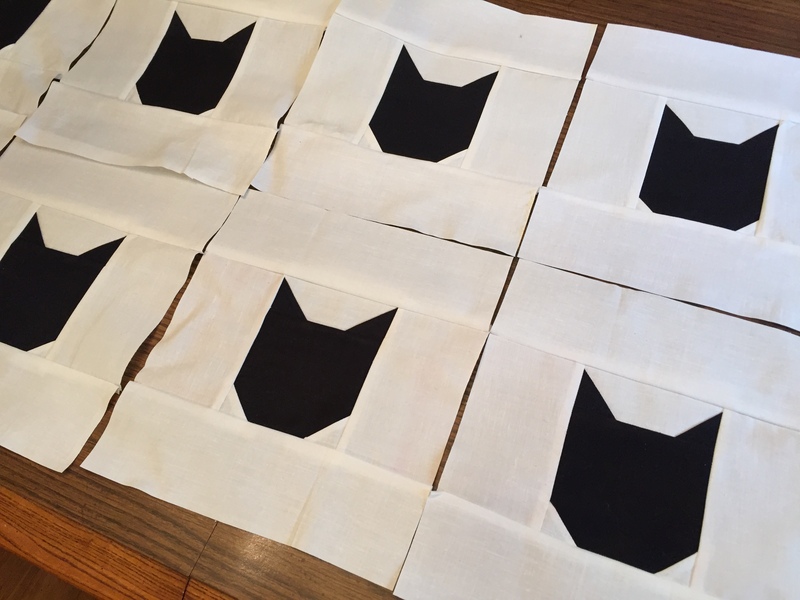 The black cat blocks require 6 pieces. 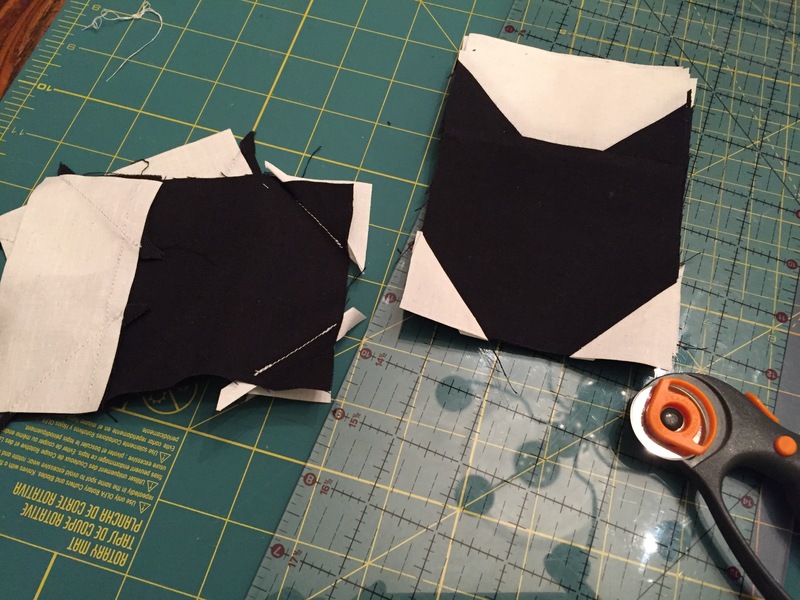 Mermag’s blog post has a wonderful step-by-step visual guide for sewing the blocks together. You start with the ears and work to create the sweet little face. 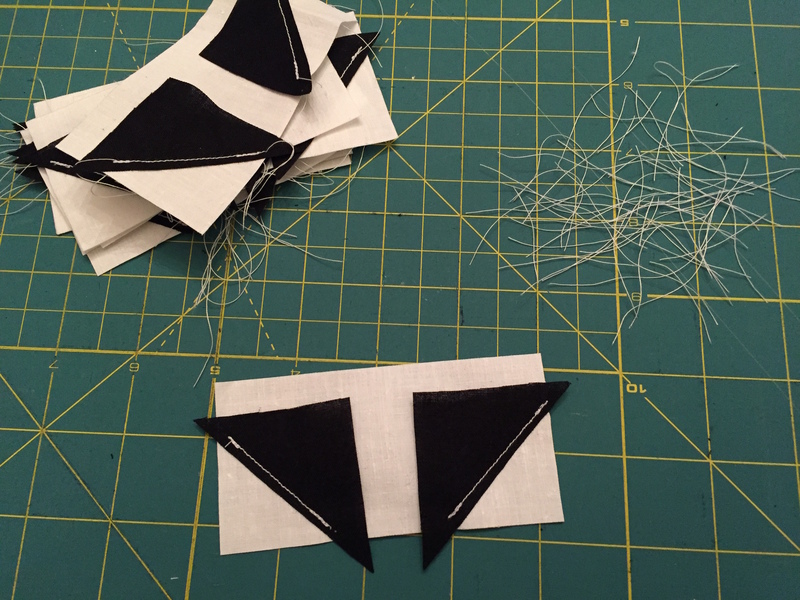 I made 42 blocks in total, and sewed them together with a 1/2 inch seam allowance. 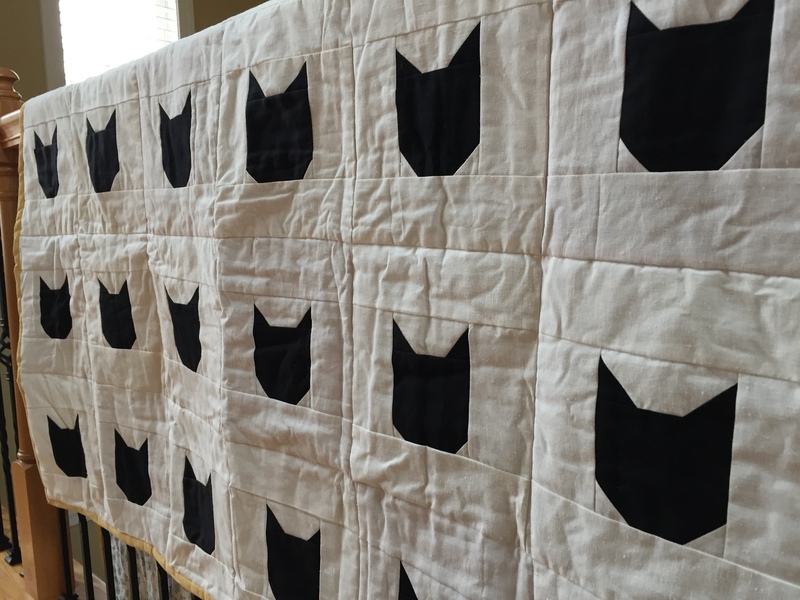 The quilt was 6 blocks wide and 7 blocks tall. 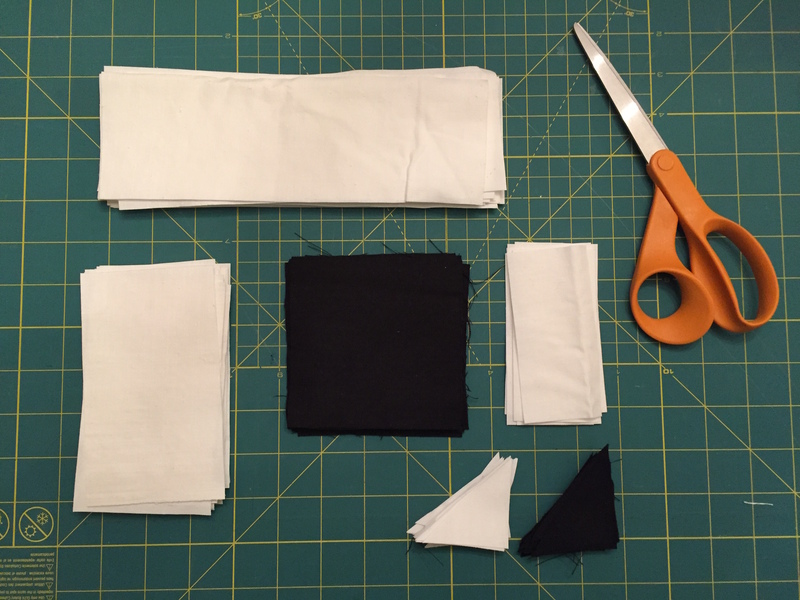 I did run out of the white fabric mid-way through. I was using scrap fabric that was this cool, stiff, linen texture, and I struggled to find a matching fabric at the store. So I bought the closest match I could find, and I purposefully spaced the blocks that used the new fabric so the change looked intentional. 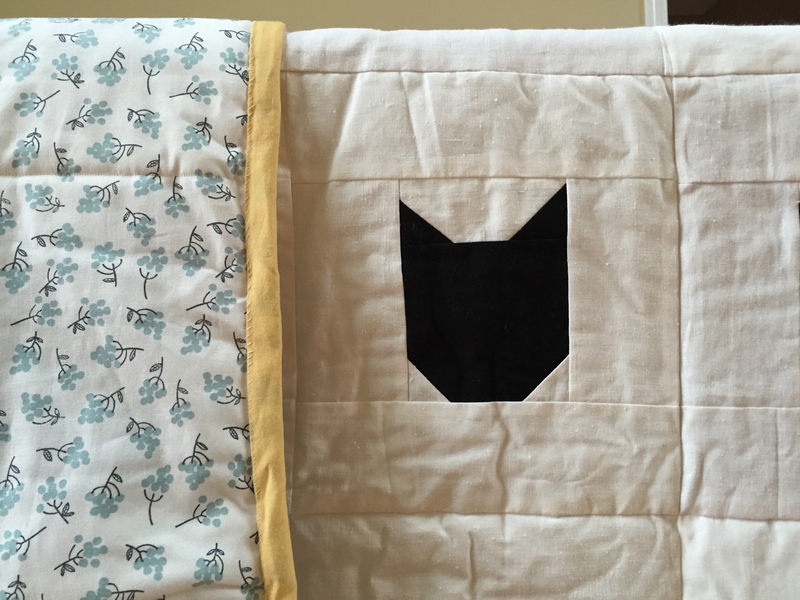 I think the difference is quite noticeable in the picture below, but with the finished quilt, you really only notice the change if I pointed it out. 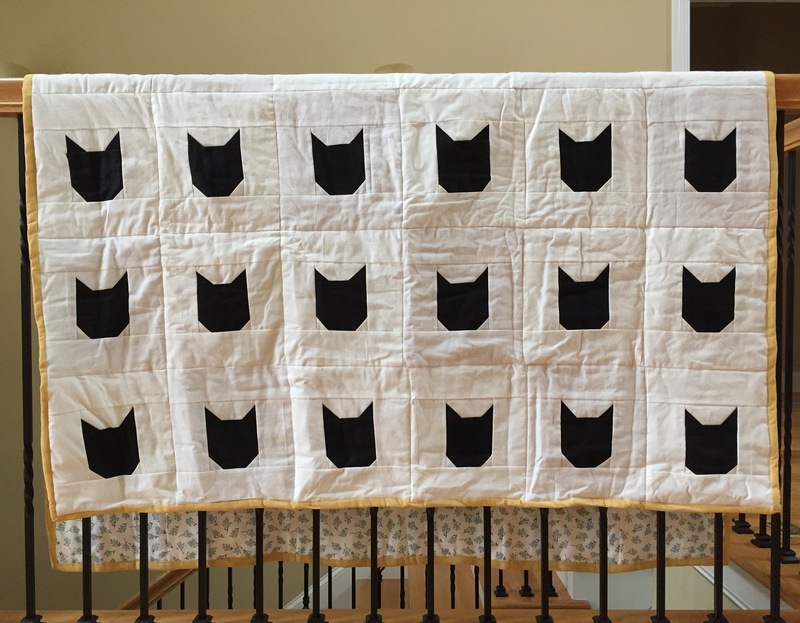 I wanted to keep the quite light and bright, so I selected a simple pattern for the back piece, and I binded the quilt with a yellow cotton fabric (my mom’s favorite color). Excuse the wrinkles. The quilt got a little squished when I wrapped it up. But wrinkles aside, I love, love, love this pattern, and I was so happy to give this to my mother for her birthday.